Mrs. Alida "Lila" Gene Green, age 87, passed away into the loving arms of Jesus on Tuesday, February 20, 2018. She was born in Muskegon, Michigan on November 9, 1930 to John & Matilda (Burgess) Kooi and married Kenneth Green on June 8, 1951. Mrs. Green was a loyal Christian that loved our Lord with all her heart and soul and was a member of Unity Reformed Church. 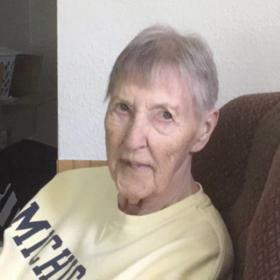 Alida had been employed at Beverly's, JC Penney, Elder Beermans and Younkers Department Stores for years until retiring. She also enjoyed walking, puzzles, shopping, family and spending time in Florida every year. Son, Kenneth (Patricia) Green of Muskegon; daughters, Laurie (Floyd) Shook of Norton Shores, Jill Green of Twin Lake & Tracy (Steve) Groleau of Ravenna; grandchildren, Matt (Vicki) Green, Veronica (Doug) Fox, Val Green, John (Renee) Braun, Jason (Theresa) Braun, Ricky (Lisa) Collis, Jerry Collis, Courtney Mertel, Jessica (Joshua) Carpenter; 12 great grandchildren; 1 great great grandchild; sister, Ardis (Ron) Erickson and several nieces & nephews. She was preceded in death by her husband, Kenneth; sisters, June Fazakerly & Doris Tornga; brother, Charles Kooi; son-in-law, John Braun. Saturday, March 3, 2018, 2:00 pm at Unity Reformed Church with Rev. David Veldt officiating. MEMORIAL: In lieu of flowers, please consider giving to St. Jude Children's Research Hospital or Harbor Hospice Foundation.